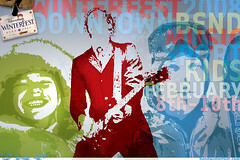 WinterFest is here! Just dropped off my T Shirts for the event. Cool Yeti Illustration concept comes alive w/ the help of Chuck Moser. 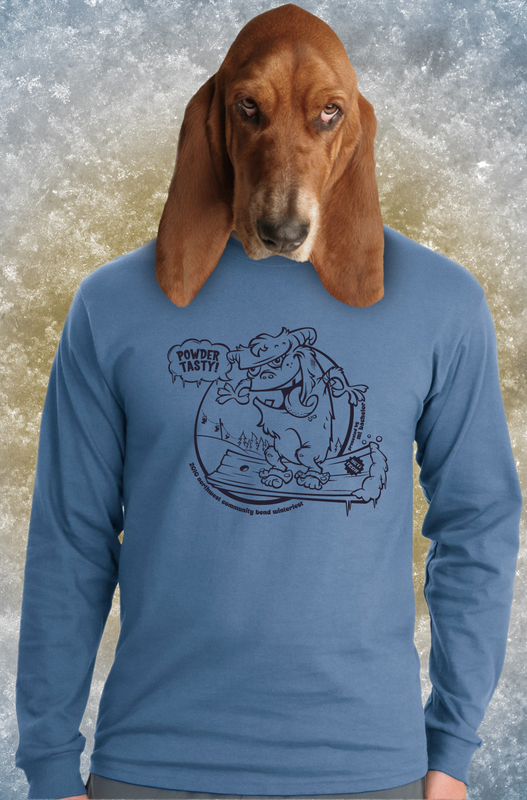 Pick one up at The WinterFest site or come on down the The Bend WinterFest this weekend and grab one at the info booth. Been kinda busy over the past few weeks since the 2009 Bend Winterfest, but had time to kill in Photoshop and put together some images from the Rail Jam. Mostly messing around with different techniques in layers really. There are sooooo many ways to layer images while applying textures and the like, listening to a little DnB while working on them seems to help too. 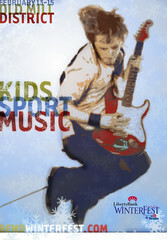 The 2009 Bend Winterfest is on! Winterfest is on, and in true form the snow has arrived with it. It’s cool to finally see all the creative materials I worked on with the Winterfest peeps up and around town. This marks the first year Winterfest will be held at The Old Mill, and not downtown – so parking should be ample and the music louder. Downtown will for sure miss this annual event. The combo of Valentines Day, Winterfest, and more snow pummeling the mountain, is no doubt going to make this a great three day weekend in Bendo for locals, visitors, and shops alike. 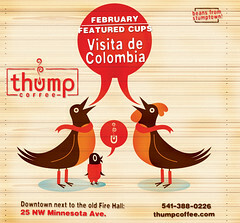 If you’re cruising downtown to Winterfest this weekend, stop by thump coffee, for some music and cuppings. Considering the population of Bend, there’s a pretty large selection of coffee shops to choose from and depending on what your looking for there’s most likely one here for you. I’ve had the opportunity to work on thump coffee creative for the past year and it’s been great to work with such cool clients. The ‘birds’ illustration for the ad was inspired and originally created by the super talented Simon Oxley. Look for it in the The Source and Cascade A&E. Winterfest should be cool this year. Looking forward to seeing “The Blakes” and “Hells Belles” (I’m not a big AC/DC fan, but an all girl AC/DC cover band should be a sight). The kids will dig the fireworks and I’ll for sure go to thump coffee to say hola to K&H and the crew. Carol Sternkopf will be there showcasing her work so that’s cool too. Working on the creative for the 2008 Winterfest was cool for sure and I can’t wait to see it all come together this weekend.